Paste paper 13 just above the white background layer, apply your mask, delete and merge visible. Select the teal circle of the template, resize paper 5 to 75% and paste, invert and delete. Delete your template layers as you go along also. Select the large gray rectangle, paste paper 14, invert and delete. Select the left blue rectangle, paste paper 1, invert and delete. Select the top blue swirl, new raster layer, fill with white, delete temp layer, select none. Select the bottom blue swirl, paste paper 1, invert, delete. Select top taupe swirl, paste paper 1, invert, delete. Bottom taupe swirl, new raster layer, fill with white, select none. Top red swirl, paste paper 3, invert, delete. Bottom red grunge swirl, paste paper 1, invert, delete. Right blue rectangle, paste paper 1, invert, delete, do not deselect yet, resize your close up if needed, mirror and paste, delete and select none. Bottom red swirl, paste paper 3, invert, delete. Select the small teal circle, resize paper 14 to 75%, paste, invert and delete. 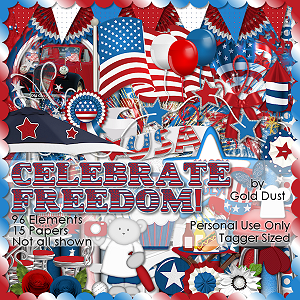 Select the taupe stars, new raster layer, fill with white, select none, remember to delete the temp layer. Select the taupe circle, new raster layer, fill with white. Select stamp 2, paste paper 1, invert, delete. Now merge the stamp, the white layer, the red layer, stars and blue layer together that you just did and move to the top of the template. Select the gray strip, paste paper 1, invert, delete. Resize your tube as needed and place on the top layer. Paste the curl ribbon under your tube layer. Resize fireworks 5 to 50% and paste on the upper right side. Resize fireworks 6 to 40% and place on the left upper side. Resize the dessert to 60% and place on the bottom right side. Resize cupcake 2 to 25% and place by the dessert at the bottom right. Resize flag 2 to 60% and place on the right side below the firework layer and adjust to your liking. Paste Doodle 1 below the mask layer, duplicate, mirror and move down a little bit on the other side. Resize the wordart to 50%, place below your tube layer on the ribbon.